and is rewarded with grand celebration. 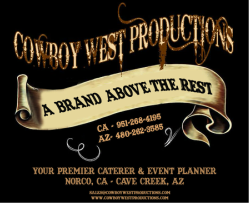 At Cowboy West Productions we are the celebration specialists to make your anniversary or significant event a terrific experience. Whether it is at one of our outdoor venues or at your residence, we bring the fun and enjoyment to a new level. Our in-house team can assist you with your event or create the entire event for you. Please explore our services and checkout our themed parties, entertainment, catering and the many other services that we provide.